Carlos Portillo has always led a privileged and sheltered life. A dual citizen of Mexico and the US, he lives in Mexico City with his wealthy family where he attends an elite international school. His friends and peers-fellow rich kids-have plans to attend college somewhere in the US or Europe and someday take over their parents' businesses. Always a rule follower and a parent pleaser, Carlos is more than happy to tread the well-worn path in front of him. He has always loved food and cooking, but his parents see it as just a hobby. When his older brother, Felix--who has dropped out of college to live a life of travel--is tragically killed, Carlos begins hearing his brother's voice, giving him advice and pushing him to rebel against his father's plan for him. Worrying about his mental health, but knowing the voice is right, Carlos runs away to the US and manages to secure a job with his favorite celebrity chef. As he works to improve his skills in the kitchen and pursue his dream, he begins to fall for his boss's daughter--a fact that could end his career before it begins. Finally living for himself, Carlos must decide what's most important to him and where his true path really lies. Have you ever made a decision based on a gut reaction? Have you ever made a decision based on what a relative's influence had on you? For Carlos, that is what he did. 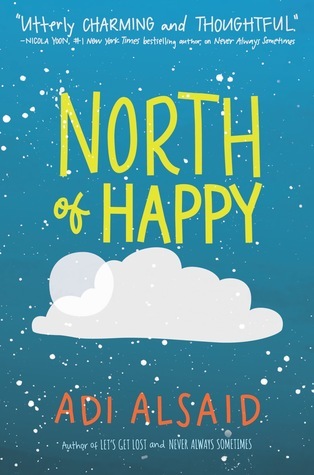 North of Happy is a story about following your dreams and just taking in the moments. One of the very first things I throughly enjoyed was how at the top of every chapter, there was a recipe. I wonder if Adi has made all of these different dishes because, taking a chance here, I felt that every dish has some connection with the chapter it was paired with. I thought this was a creative and imaginative way of enticing the reader to see how a dish could be drawn out in a scene. I think there is a part in everyone that wishes they could be like Carlos. Regardless of where you come from. The idea of just dropping your everyday life and taking a chance of a lifetime to follow your dreams can be scary. Going to a new place, immersing yourself in a different culture, and surrounding yourself with different people. Scary but exciting. The story was an adventure. An adventure I am glad I took part in. I read this book on a plane ride home and the whole time up in the air I felt like Carlos taking his first step in his own adventure. Although I was flying home and I knew what to expect when I landed, I am always looking forward to my next flight. To my next plane ride. To my next adventure. Adi Alsaid writes a novel challenging readers to to follow the status quo. He writes a novel challenging us to follow our dreams everyday. He writes a novel that is emotionally impactful and full of heart. For a book that shows a boys happiness in the smallest of things, even an omelette, Adi Alsaid writes a brilliant story that will take you to the kitchen to make a delicious dish.